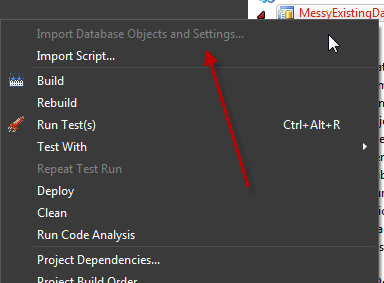 This is a quick walk through of how to setup a database, create some model objects, and build a scaffold for CRUD (Create, Read, Update, and Delete) all using ASP.NET MVC 3 and Visual Studio 2010. 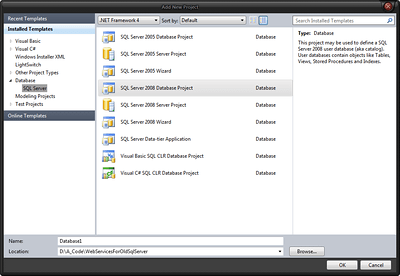 Open Visual Studio 2010 and start a database project as shown. Next create an ASP.NET MVC 3 Web Application in this solution. Now open the Server Explorer in Visual Studio 2010 (You might have to click on View to find it if it isn’t already available in the main IDE). Right click on the Data Connections node in the Service Explorer Tree. Select Create Database and provide a name for the database. Next in the Server Explorer, right click on the newly created database and select New Query. Then in the query window paste this SQL create script in and run it by right clicking and selecting execute. Once the table is created bring to focus the Solution Explorer and right click on the Database Project, selecting the Import Database Objects and Settings. Next select the correct database connection, and leave everything else as it is set. Next the wizard will finish importing the database objects. If you look through the folder tree of the project you’ll find individual files for the table, defaults, and other object settings. Now right click on the Models directory of the ASP.NET MVC 3 Project that was created earlier. Select add and then new item. 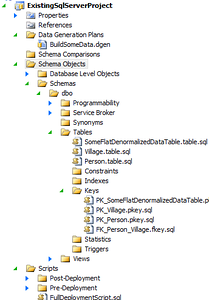 In that dialog add a new ADO.NET Entity Data Model. 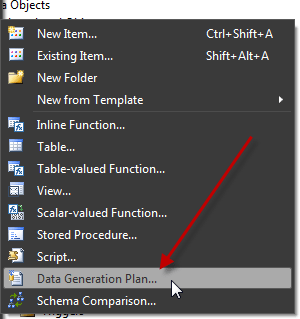 A dialog will appear, select the option to Generate from database and click next. Next select the correct database connection again, then click on Yes to save the sensitive data (which if you’re using windows authentication it isn’t really going to save anything dangerous). Make sure the entities are named appropriately and click Next. Once done and finish is clicked, the entity model file will show the display view of the entity that was just created. Now right click on the controller folder and select to create a new controller. Be sure to click the advanced options and select the layout page. Now click on Ok and then Add. Visual Studio 2010 will not generate the scaffolding for the controller and views around CRUD operations. CODE: All the code for this project is available in the Lesson 1 – ScaffoldGeneratedWidgetz. This entry was posted in .NET Bits, How-to and tagged asp.net mvc, controller, model, mvc, scaffolding, sql, sql server, sql server 2008, view, visual studio 2010 on August 16, 2011 by Adron.